Dr John Stavrakakis and Paula Dawson testing Phantom haptic interface at Holoshop lab, ViSLAB Sydney. An insight into the research and development of Holoshop projects. Sessions enable participants to interact with the Holoshop haptic interface, demonstrating it’s potential as a tool for holographic and new-media arts practice. Guided by the research team, these workshops are a glimpse into current Holoshop research. Participants will be able to draw their own images in 3D using the Phantom Haptic interface and Holoshop software. No previous experience of using 3D software or drawing is necessary as the system is very easy to use and quite intuitive. The workshop presenters will give a tutorial on how to use the software and hardware and assist you as you go. One of the unique features of the Holoshop software is the ability to draw onto three dimension forms in the 3D environment by making the virtual drawing pen magnetic. A library of 3D forms will be available for participants to draw onto. 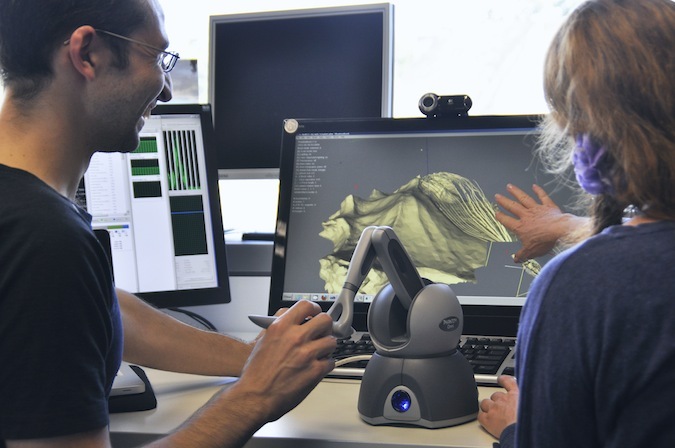 For participants wishing to use their own image resources the team will prepare any images you capture and then assemble in 123Dcatch, ready for the workshop. After enrolling in the workshop, participants will be contacted via email with detailed instructions. As well as exploring the creative potential of the Holoshop haptic interface, the workshop sessions will investigate the development of artworks exhibited at Holoshop: Drawing and Perceiving in Depth in COFA space. Demonstrating the translation of drawn images created with the Holoshop interface across several new-media outputs, these workshops encourage participants to reflect on the unique perceptual effects created by the Holoshop. This research is supported under Australian Research Council’s Discovery Projects funding scheme (DP1094613). Free to ISEA2013 Registered Delegates.